The Temporally Smoothed Weekly AQUA C6 Moderate MODIS NDVI data were developed to provide researchers an analysis ready NDVI dataset, at a spatial resolution of 250 meters, suitable for time series analysis applications and research. Consistent and standardized NDVI data have proven to be a useful resource to a wide range of applications in environmental science. However, often the raw NDVI is affected by a number of degrading phenomena including cloud contamination, atmospheric perturbations, and variable viewing geometry of the sensor; all of which usually reduce the quality and pixel value of the NDVI data. To minimize these effects on the NDVI and maximize the total number of observations per year, the Temporally Smoothed Weekly AQUA C6 MODIS NDVI started out with weekly composited MODIS NDVI dataset, known as expedited or eMODIS NDVI, developed at the U.S. Geological Survey, Earth Resources Observation and Science Center. However, the composited NDVI data contain lingering quality effects that often reduce the NDVI value and, more importantly, disturb the temporal profile of the vegetation signal. Rare, artificial spikes and anomalies are known to be present in the MODIS C6 NDVI data which can reduce its utility in science-based applications. To address this issue, a de-spiking methodology and temporal smoothing process was applied to the weekly time series eMODIS NDVI data to create an analysis ready dataset. The NDVI data range has been scaled to a data range of 0-200 to fit into a space-saving 8 bit image format. The Temporally Smoothed Weekly AQUA MODIS NDVI product provides researchers an analysis ready NDVI dataset, suitable for time series analysis applications and research. 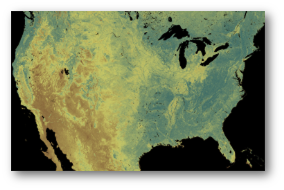 Users of these NDVI data sets should cite this DOI: https://doi.org//10.5066/F7BR8RGQ.